The guys have been busy in the Engine Power shop! 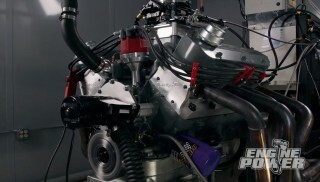 We went behind the scenes to show you what they've been working on and give you a small peek of what you can expect in a brand new episode of Engine Power this season! While the new dyno room is being completed, hosts Pat Topolinski and Mike Galley have been occupied with a fun "little" project. At the moment, they're busy disassembling their 351 Windsor project. The plan is to turn this 351 into a 408ci stroker. As we are sure you know, the fun won't stop there. Just wait to see what they have in store for this bad boy. Here you can see them disassembling the engine by removing the pistons along with the connecting rods, rod caps, and then the crankshaft. Check out the latest episode coming Sunday, January 20th at 7:30 am ET on History!